I started the edition of this contribution in June 2015 when I did my first trials with the Orthanc server. In the meantime I created OrthancPi, a mini headless PACS server which is used to host the DICOM teaching files for RadioLogic, an educational tool for radiologists which is currently in alpha test state. It’s now time to update and finalize my post about the installation of the Orthanc server on my MacBookAir computer. The goal is the development of OrthancMac, a midi PACS server for RadioLogic which is more powerful and user-friendly than OrthancPi. Some figures included in the present post refer to earlier versions of Orthanc and to OS X Yosemite because it would be waste time to replace them all with current screenshots. Some informations provided in the present post are trivial and redundant with my other posts about DICOM and Orthanc. I assembled them for my own needs to get familiar with Orthanc and OS X developments. Orthanc is a open-source, lightweight DICOM server for healthcare and medical research. It’s now also called a VNA (Vendor Neutral Archive). Orthanc can turn any computer running Windows, Linux or OS X into a PACS (picture archiving and communication system) system. Orthanc provides a RESTful API and is built on the top of DCMTK (collection of libraries and applications implementing large parts of the DICOM standard). Orthanc is standalone because all the dependencies can be statically linked. The developer of Orthanc is Sébastian Jodogne, a belgian medical imaging engineer (2011) of the CHU of Liège (University Hospital) who holds a PhD in computer science (2006) from the University of Liège (ULG). The Orthanc source code is available at Bitbucket. The latest stable Orthanc version is 1.3.1 released on November 2, 2017. Some changes have been done since that date. I downloaded the default (mainline) zip file from the Bitbucket project page and saved the unzipped orthanc folder into a directory named orthancmac located at the Mac OSX (El Capitan) desktop. My configuration is slightly different than the assumed structure in the Darwin compilation instructions, but I prefer this development setup. The build infrastructure of Orthanc is based upon CMake. The build scripts are designed to embed all the third-party dependencies directly inside the Orthanc executable. Cmake uses the concept Out of source Build where the build directory is separated from the source directory. I created a folder build inside the orthanc directory and opened a terminal window inside this build folder. All the files have been saved in a new folder orthancmac/orthanc/ThirdPartyDownloads. The programs SQlite3 and Python 2.7.10 have been found installed. Doxygen not found. The documentation will not be built. 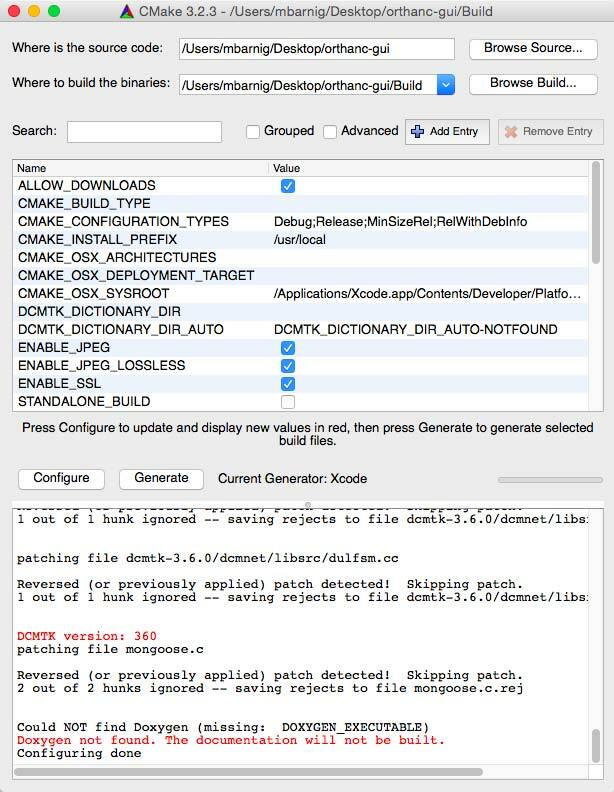 The following figure shows the building process when using the Xcode GUI. The eight targets are show at the left in red. To build the Release version, I modified the scheme in the Xcode-GUI. Building with the command line is much easier. The Release folder contains the executables Orthanc, UnitTest and OrthancRecoverCompression, the libraries libCoreLibrary.a, libOpenSSL.a, libServerLibrary.a, libServeFolders.mainline.dylib and libModalityWorklists.mainline.dylib. These files are the targets of the Xcode building process. At the first start of the server, a new folder OrthancStorage is created inside the Release directory. The OrthancStorage folder contains the SQLite files index, index-shm and index-wal. Entering the url localhost:8024 in the Safari address field opens the main window (explorer) of the Orthanc server. Clicking the upload button opens an new window in the Orthanc server where I added some DICOM files from CD’s (drag and drop). The DICOM files are saved in sub-folders in the OrthancStorage directory in a flat structure. I modified the configuration.json file to allow the remote access to the server from another computer located in the same local network. Because of its focus on low-end computers, Orthanc implements disk space recycling: the oldest series of images can be automatically deleted when the available disk space drops below a threshold, or when the number of stored series grows above a threshold. This enables the automated control of the disk space. Recycling is controlled by the MaximumStorageSize and the MaximumPatientCount options in the Orthanc configuration file. It is possible to prevent patient data from being automatically recycled by using the Unprotected/Protected switch that is available in Orthanc Explorer. 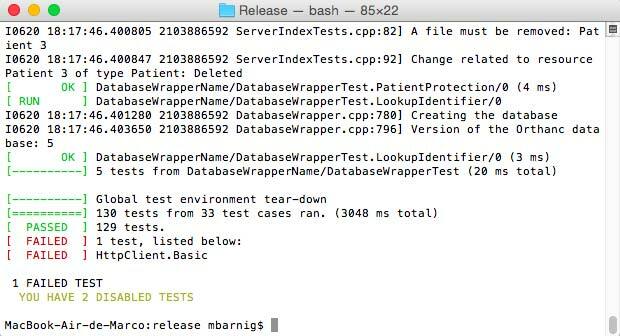 When the UnitTests executable is launched from the terminal window in the Release folder, 163 tests from 43 test cases were run. All these 163 tests passed. Two tests were disabled. Two new folders were created in the Release folder by the testing process : UnitTestsResults and UnitTestsStorage. A complete grid of the Orthanc RESTful API is available as Google Spreadsheet. Orthanc as a Hospital PACS? Note : the new versions released since spring 2016 have not yet been tested. It will be done in the coming days. 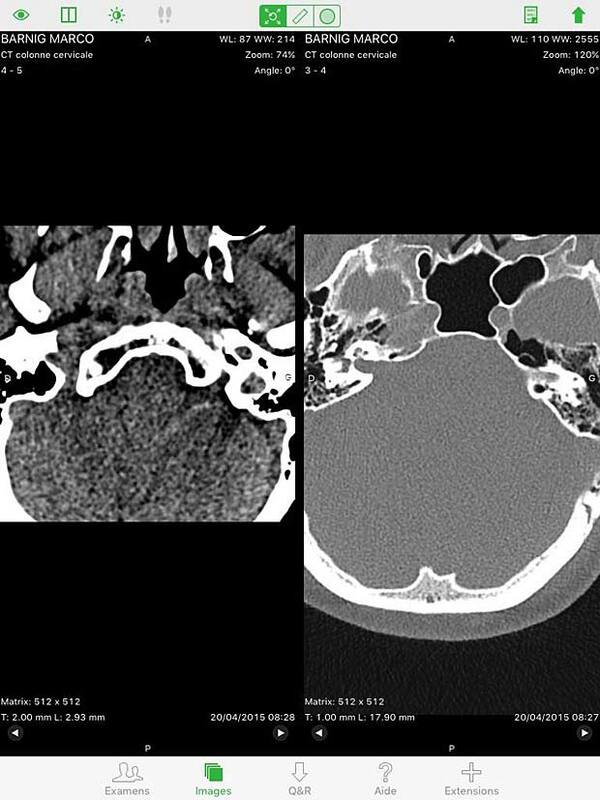 This contribution refers to my recent updated post about DICOM image viewers. Mobile DICOM viewers are becoming more and more popular. They are very useful in the context of medical applications in the cloud. Most web viewers can be used on mobile equipments (tablets, smart phones, …), but the focus of this post are native applications designed for Apple iOS or Android devices. DICOM Web viewers are handled in a separate contribution. In the present list I considered only those applications that have been updated after January 2014, with some exceptions. To test the selected apps, I used Orthanc (Windows versions 0.9.5 and 0.9.6) as PACS server. 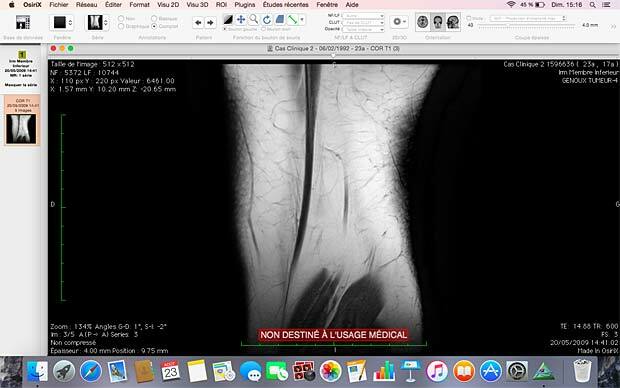 To have realistic DICOM samples, I uploaded some DICOM studies from me and from family members relative to exams done in the past in hospitals in Luxembourg and France. The local IP is the address of the used mobile device. 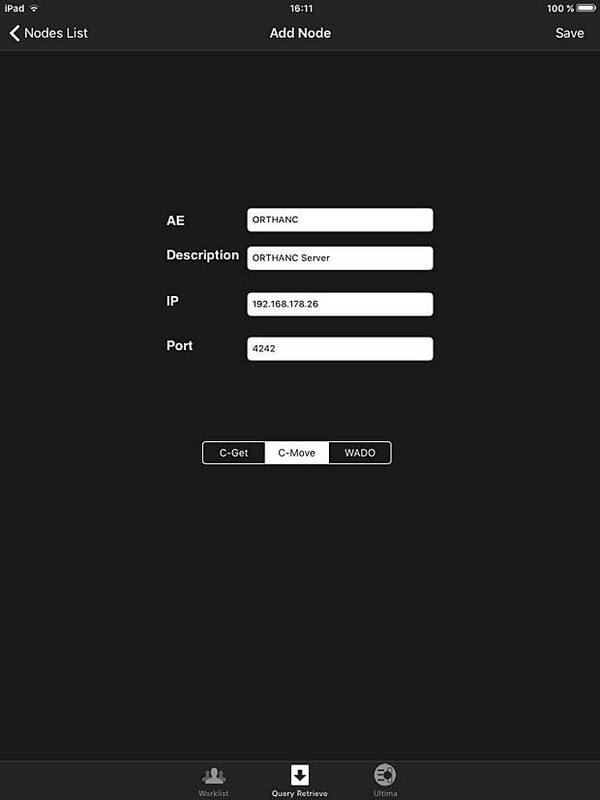 If no settings are available for the port numbers, the port number of the server can be added to the remote IP address. The standard port number 104 can be tried as a first guess for the settings of the viewer. 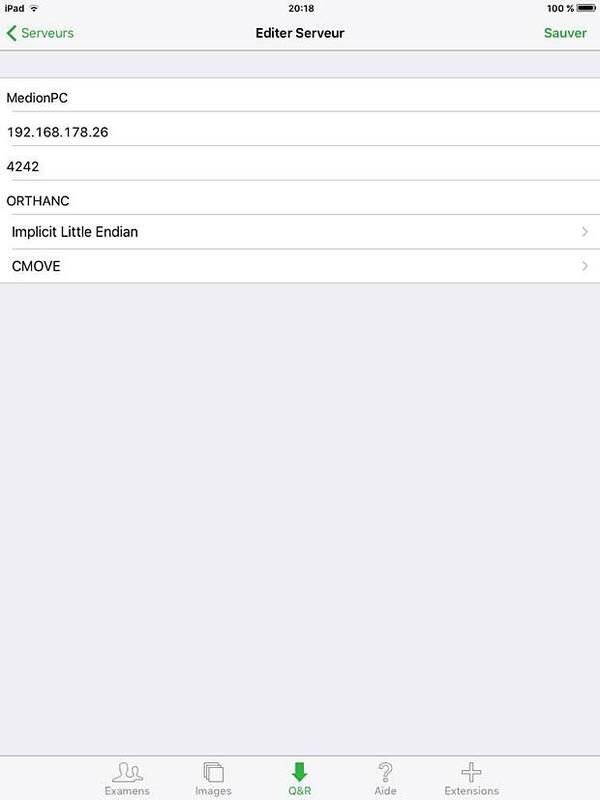 If no local AET settings are provided, the iPad name can be tried as a first guess. Another possibility is to use a DICOM network analyser like DVTk to detect unknown parameters. If the C-MOVE protocol is not supported by the viewer, the WADO or C-GET protocols can be an alternative. In the presentation of the selected mobile viewers, I generally used the terminology published by the developers, even if I disagree with their claims. In the case of apps that worked as expected with the Orthanc server, I added some screenshots to show the look-and-feeling of the viewer. 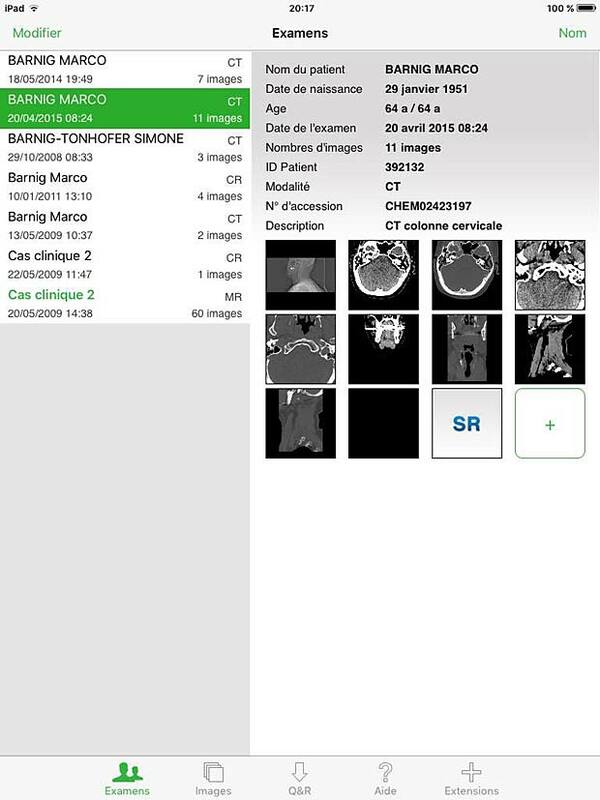 aycan mobile is an iPad app which allows to receive and display DICOM images in an easy, secure and fast way. Developed by aycan Digitalsysteme GmbH, the current version 1.08.000 was updated on July 22, 2015. 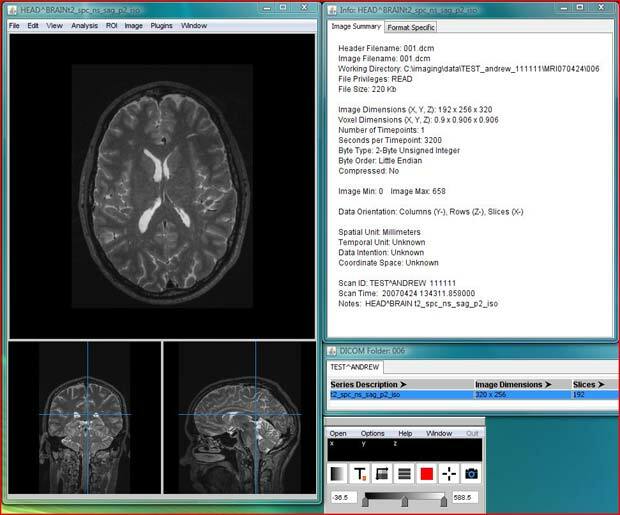 The viewer works only with the aycon DICOM workstation, which is based on Osirix. A demo server with ID and password “aycan” allows to explore some demo studies. A subscription is required to use all features of the the ayMobile communication service. A free 30-days-trial subscription can be ordered on the aycan website. 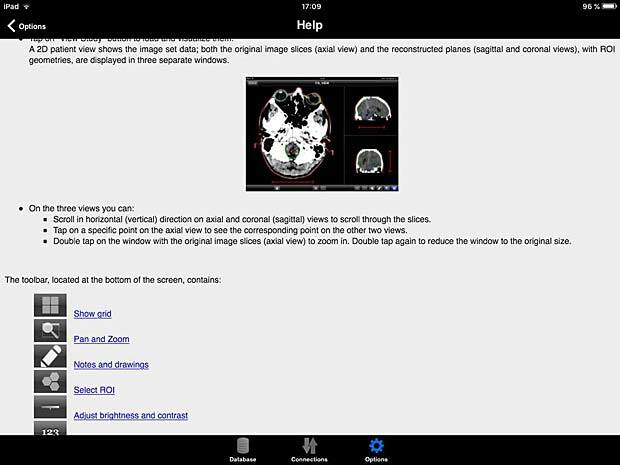 DICOM-AVC is available for iPad and iPhone. The current free version is 2.2 has not been updated since July 12, 2012. It has been developed by the The New Medical Product Server LLC who claims that DICOM-AVC is a complete real-time collaborative imaging and videoconferencing tool which was once the number one downloaded app on the AppStore. To use the app, registration of an account is required, which can be upgraded to a premium account for 19.99$ per year. Today it’s displayed as black screen on my iPad. 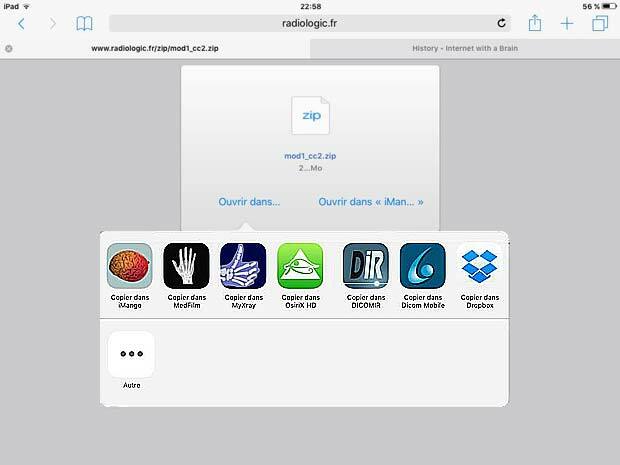 Dicom Mobile is a simple but powerful DICOM viewer for iPhone and iPad, developed by Luigi Orso. The current version is 1.4.0, updated on June 3, 2015. The price is 2.99$, with additional in-app purchases for extensions. The developer provides support on his website. DICOM files can be loaded from a DropBox account or from a Web server, but not from a PACS server. 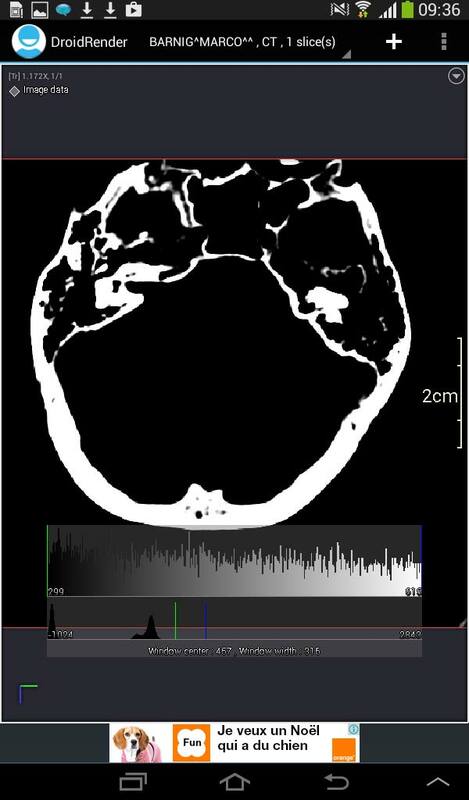 The free version 1.0 of DICOM Viewer HD was released on July 4, 2014, by Wingspan Xi’an Electronic Technology Co., Ltd from China. I was not able to evaluate the app, the login or registration in the “User Manageer” always fails. 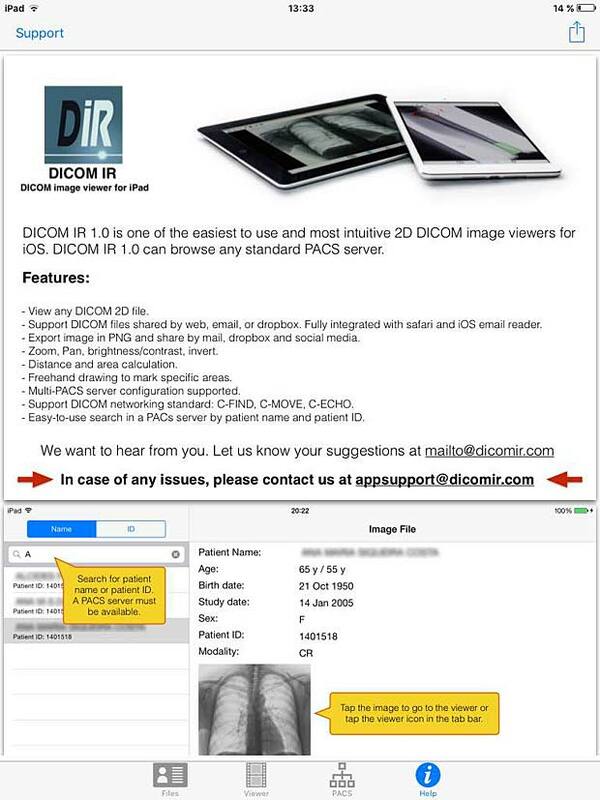 DICOM IR is one of the easiest and most intuitive 2D DICOM Image viewers for iOS. DICOM IR can browse any standard PACS server. DICOM IR is developed by Pietro Zuco, a freelance mobile developer based in London/Tokyo/Barcelona. Pietro Zuco has a solid experience developing 2D games, utilities, educational and entertainment applications on iOS and OSX systems. 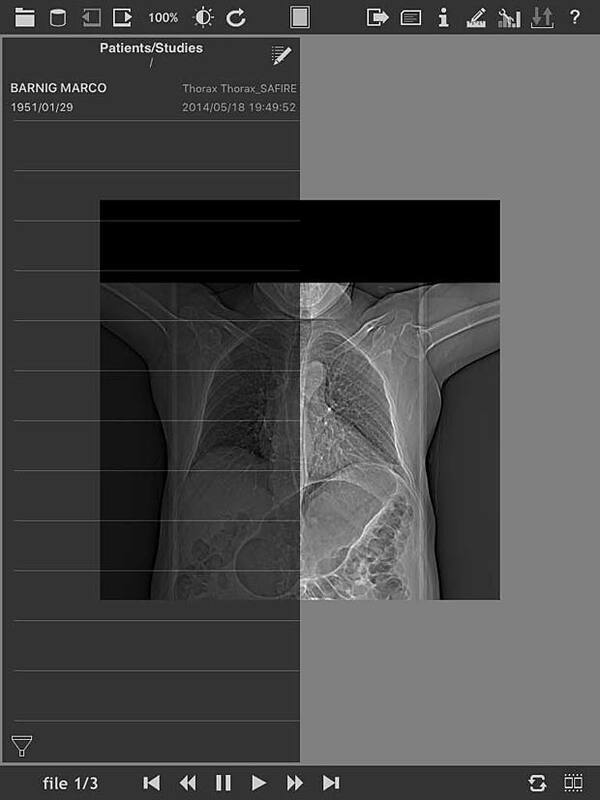 Version 1.0 of DICOM IR was released on July 25, 2015 and is free for a limited time. 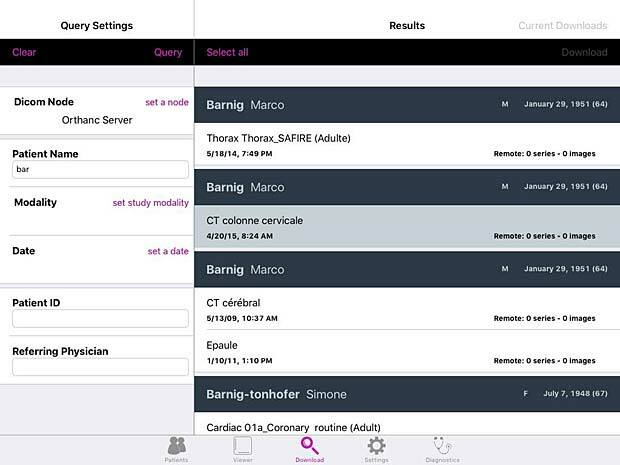 The app supports C-ECHO, C-FIND and C-MOVE queries. DICOM IR has a very clean GUI, an excellent user guide, a perfect configuration panel, a performant viewer and it works as expected with the Orthanc server. My compliments to this author. 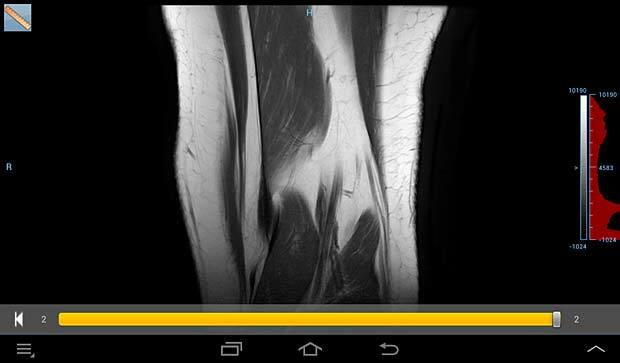 The iDO medical image viewer is quickly becoming the next generation in mobile medical image viewing by combining multi-modality imaging with individualized physician workflow. Developed by EBM Technologies, Incorporated, the current version 1.1.4 was updated on March 30, 2016. 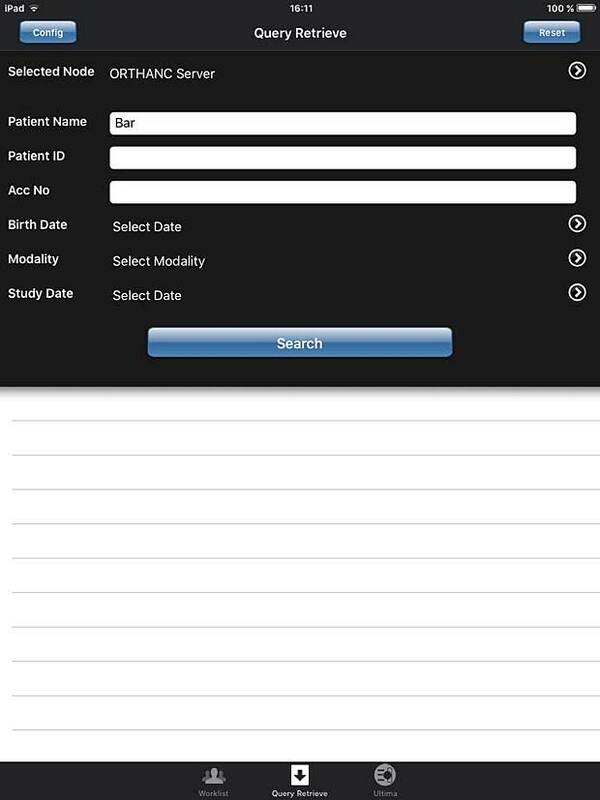 This application requires the EBM iDO server, demo servers to view sample data and basic features of the app are available and can be selected in the settings panel. 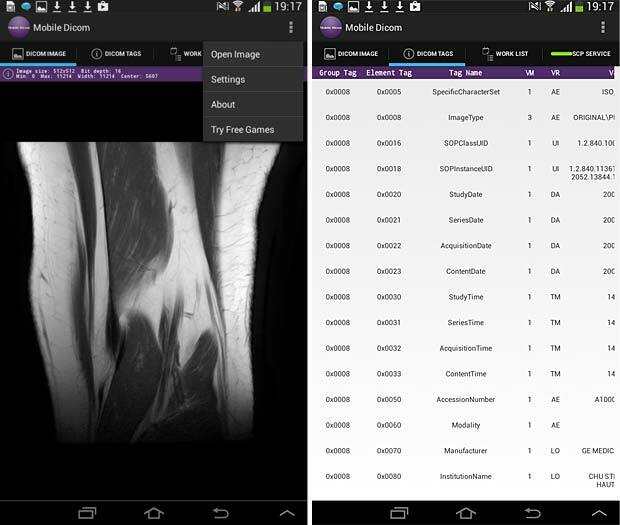 imageFLOW.mobile is the best-in-class mobile application for medical imaging PACS users on iOS devices. imageFLOW is developed by imagitive GmbH. The current free version 2.0, based on Imagitive’s DaVinci framework, was updated on November 25, 2015. A DemoServer mode to explore some DICOM studies is enabled by default. 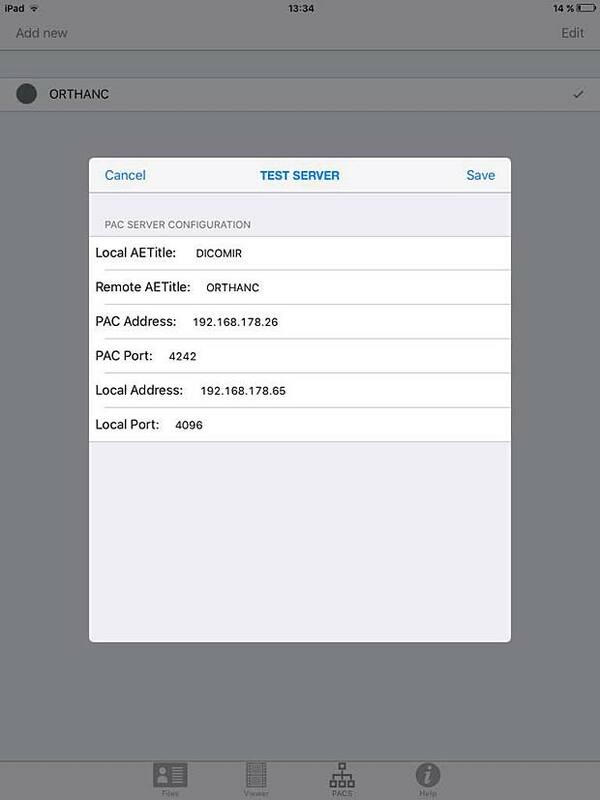 A PACS server can be configured in the general iOS settings, nevertheless access trials failed with a “Server Authentication” error message. 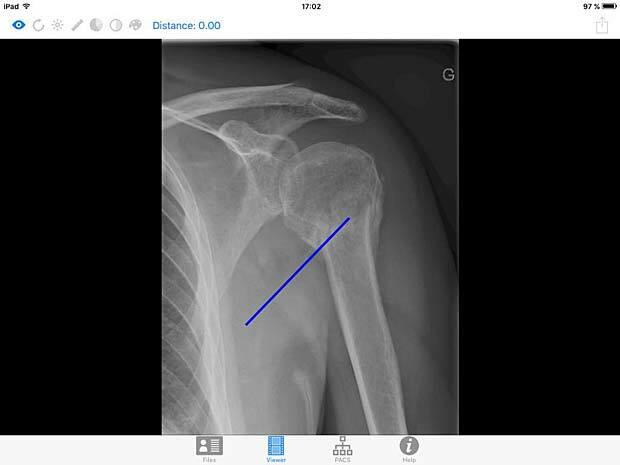 iMango is the iOS adaptation of the famous Mango DICOM viewer developed at the Research Imaging Institute (RII), an Organized Research Unit (ORU) of the University of Texas Health Science Center at San Antonio. It works on iPad’s. The current version 1.3 was updated on June 10, 2015. The price is 14.99$. 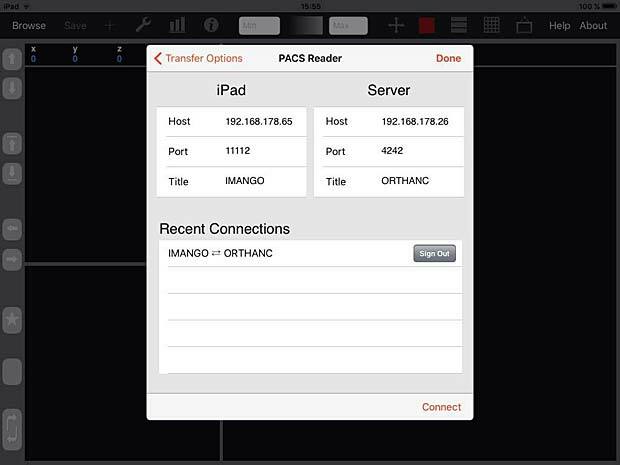 A PACS server can be configured in the general settings and the app works as expected with the Orthanc server. iMango also supports the WADO protocol. 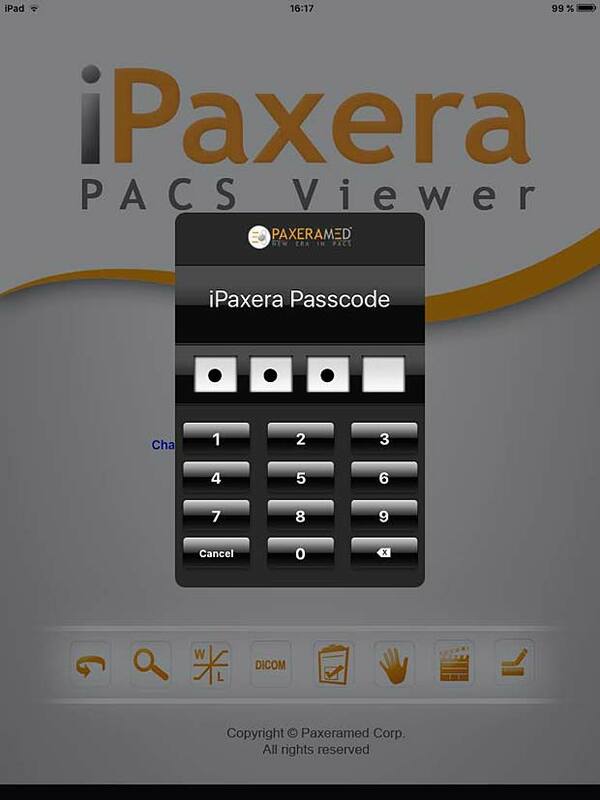 iPaxera is one of the fastest and easy to use PACS viewing applications specifically designed for viewing and navigating studies with your iPad, iPhone, and iPod. iPaxera is developed by Paxeramed Corp, a world leading medical imaging solution developer based in Boston, that develops a full range of medical imaging solutions. The current free version 3.10 was updated on May 4, 2016. A PACS server can be configured in the “Add Node” panel. Ipaxera works as expected with the Orthanc server. The app also supports the WADO protocol. Onn Akbar Ali reported that Ipaxera can display multiframe Jpeg images ( such as angiography ) quite well. 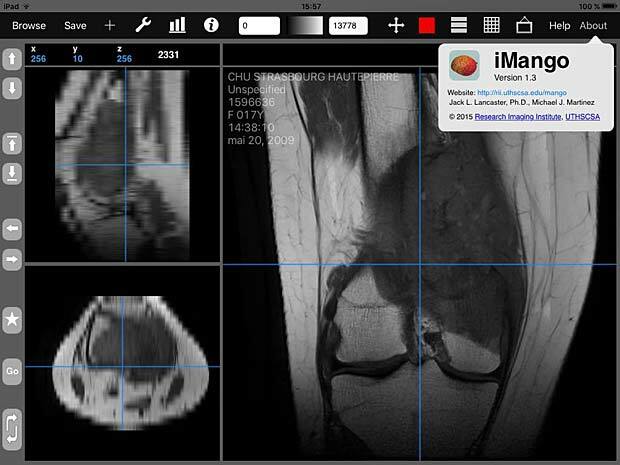 iTA VIEW is a viewer for DICOM and DICOM RT objects developed for iPad and dedicated to radiotherapy. 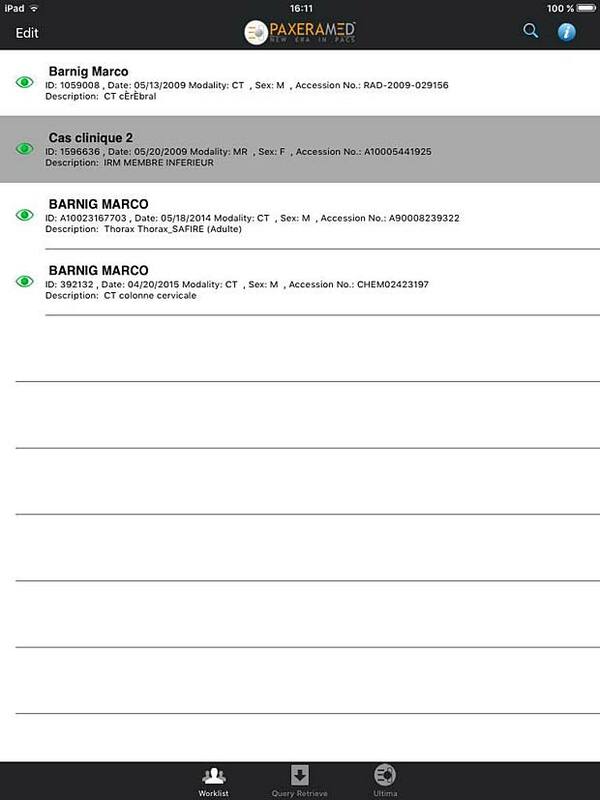 The app is developed by Tecnologie Avanzate TA srl in Italy. The current version 1.2.0 was updated on March 8, 2016. 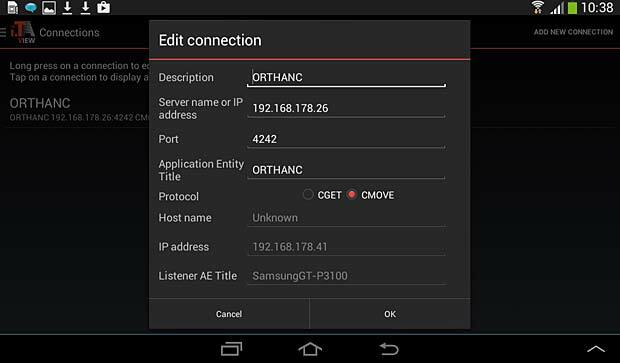 The app works with the Orthanc server. To transfer studies without limitations, an upgrade to the full version is required. The price for the upgrade is 29.99 EUR. 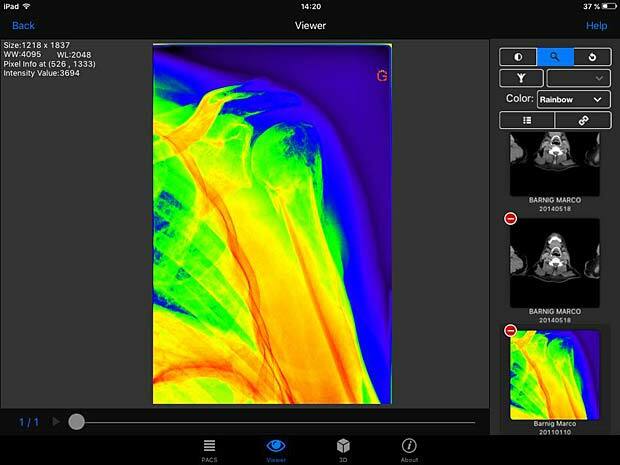 Jack Imaging Medical Image Viewer is a medical image viewer for the iPad that makes use of nephosity’s patent pending technology, the latest in medical imaging innovation. 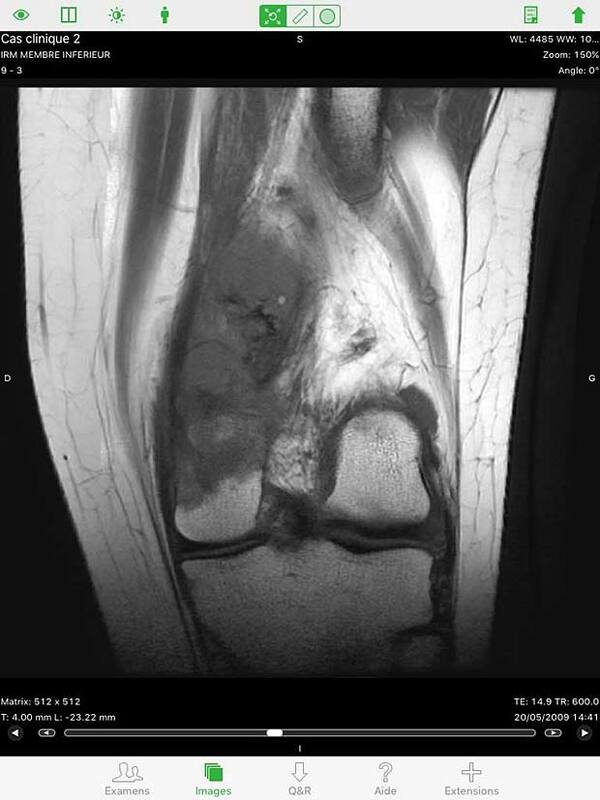 It supports reading the DICOM format and the most common imaging modalities. The viewer is developed by Nephosity Inc. The current version 3.0.5 was updated on January 25, 2016. The prize is 0.99$. The viewer works only with the Jack Imaging platform which stores the DICOM data in the cloud. Currently Amazon’s cloud infrastructure is used to provide the best performance and highest security levels. During a beta phase the Jack Imaging platform accounts are offered for free. On 4th generation iPads the Jack Imaging viewer offers FDA cleared capabilities. 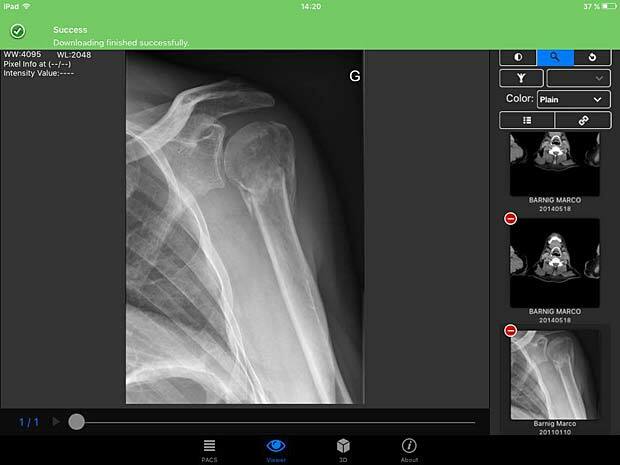 Keiron is an innovative App that allows you to view, annotate and analyse radiographic images stored in the DICOM standard. The current free version 1.0 was released on May 4, 2015. Keiron is developed by Digital Video S.p.A., the creator of Toonz. A PACS server can be configured in the settings, but only the ECHO and C-FIND queries are working with the Orthanc server. The “download” button to load DICOM instances is disabled. The LEADTOOLS Medical Web Viewer is a zero footprint solution available for iPad and iPhone, developed by Leadtools Technologies Inc. The current free version 3.0 was updated on May 27, 2016. The viewer works only with LEAD’s web servers so you can quickly access the features of the LEADTOOLS Medical Web Viewer Framework SDK with the default settings. 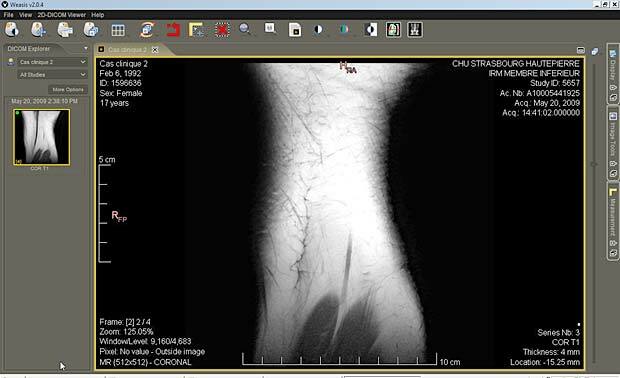 loDicom Viewer allows you to view, archive and transfer 2D medical images in DICOM format. Developed by Luigi Orso, the current version 4.1.1 was last updated on July 30, 2014. The price is 12.99$. 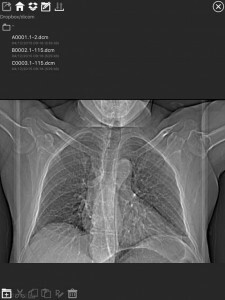 The developer is also the author of the DICOM Mobile viewer. He provides support on his website, which is not useless, because the app crashes systematically on my iPad. ECHO tests with the Orthanc server are succesful, but a C-FIND query leads to a crash. I was only able lo load DICOM files via a DropBox. The GUI is not very intuitive, the user guide is not very helpful. 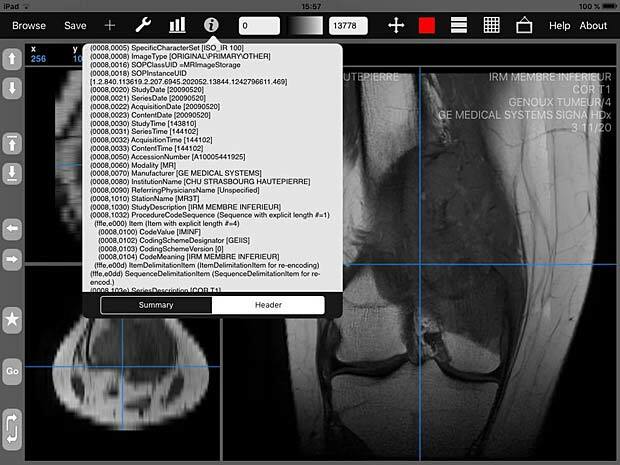 MedFilm is a fast dicom viewer developed by Fuli Wu, a researcher at the Zhejiang University of Technology in Hangzhou, China. The app is available for iPad and iPhone. The current free version 4.25 was updated on June 1, 2016. 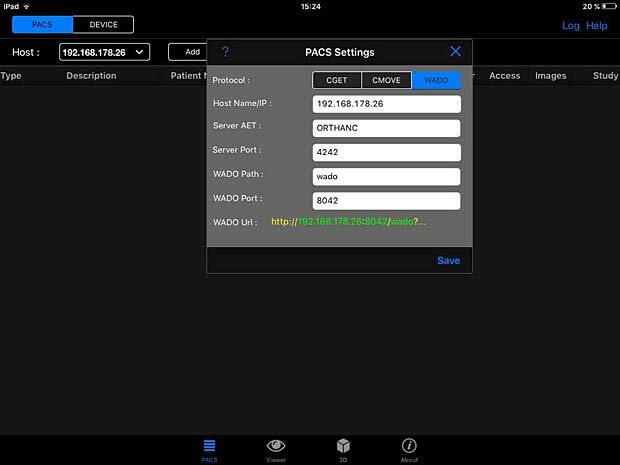 A PACS server can be configured with support of the WADO protocol. The C-MOVE protocol is not supported. 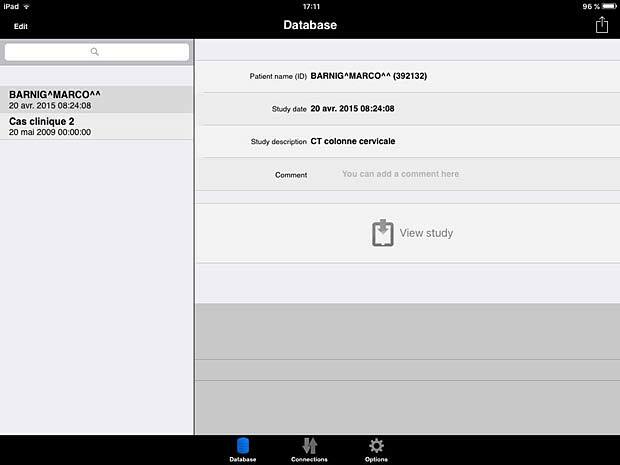 Med View is developed by Matthias Rudolph and available for iPad and iPhone. The current free version 1.1 was updated on October 23, 2015. 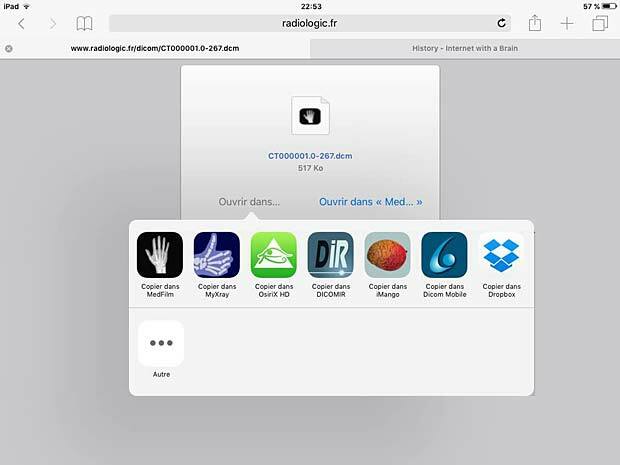 DICOM files can be loaded from the iTunes file sharing service or from FTP servers. 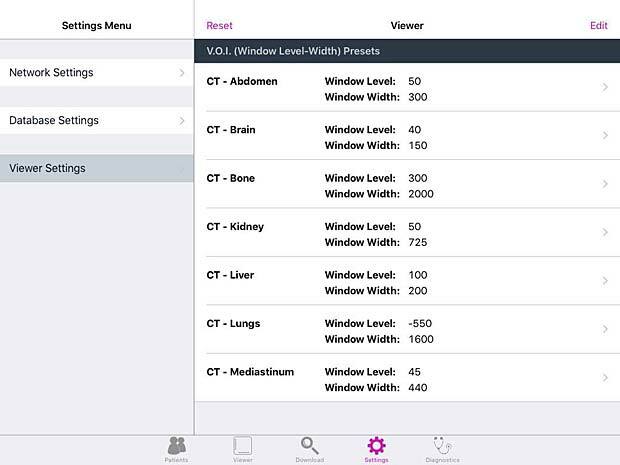 The Mobile MIM software program is used for the viewing, registration, fusion, and/or display for diagnosis of medical images from various modalities. Developed by MIM Software Inc., the current version 4.0 was updated on July 26, 2016. Image data can only be transferred to the device by using MIMcloud or MIM 5.1+ workstation software. mRay, developped by mbits, is available for iPad and iPhone. The current free version 4.1.6 was updated on October 4, 2016. mRay is a CE certified and approved medical product. To be able to receive images in mRay from your PACS, the mRay Server Software must be installed, which can be used free of charge for an evaluation period. 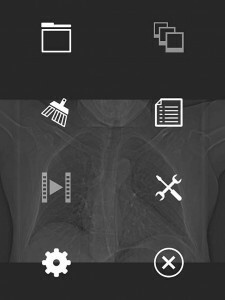 MyXray is an easy and intuitive app that will let you see your x-ray files as a real doctor. The free version 1.0 was released on September 8, 2015. 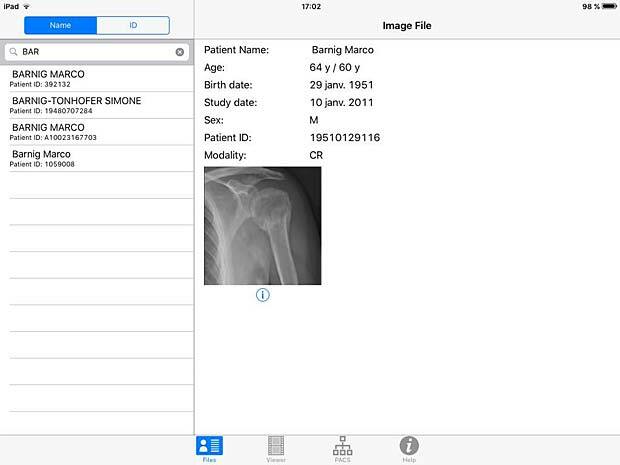 The app is developed by Pietro Zuco, the author of the outstanding DICOM IR app. MyXray is a lite version of DICOM IR without support of DICOM communications. Nuance PowerShare Mobile gives you instant access to your medical images and reports stored on the Nuance PowerShare Network using your iOS device. The free version 5.5.10 was updated on August 16, 2016. I was not able to load this app from the AppStore. 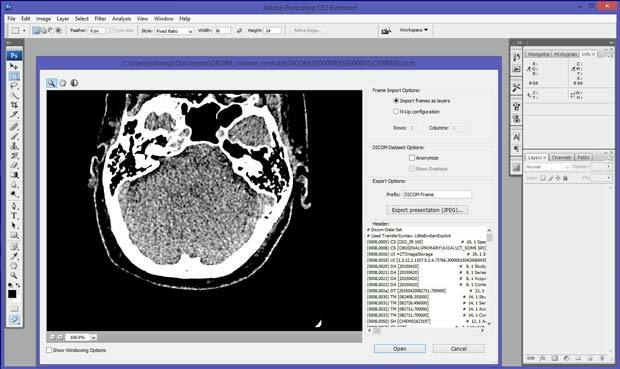 OsiriX HD is the iOS adaptation of the famous OsiriX DICOM viewer, running on Mac OSX, which is considered as a reference for DICOM image viewers. It works on iPhone’s and iPad’s. The current version 4.2 was updated on October 14, 2016. The price is 49,99$, with additional inline sales. Osirix HD can be configured in the general settings. The app works as expected with the Orthanc server and supports also the WADO protocol. 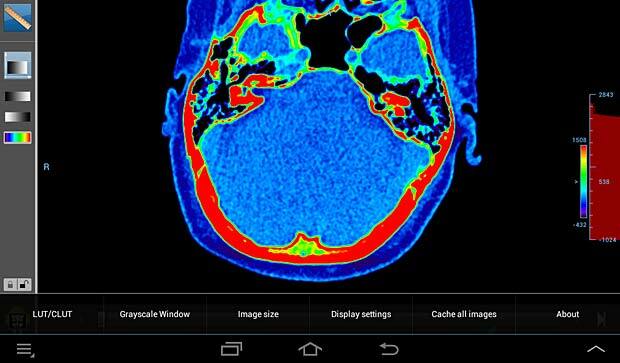 PACS DICOM Viewer app is a free, vendor-neutral PACS browser and DICOM viewer which works on iPad. It is developed by Logicpond Inc, a California based product design and development solutions company. The current version 2.1.1 was updated on November 11, 2015. The viewer can be configured to work with the Orthanc server, but the C-MOVE queries are aborted during the image transfer. The WADO protocol is also supported and works with Orthanc. 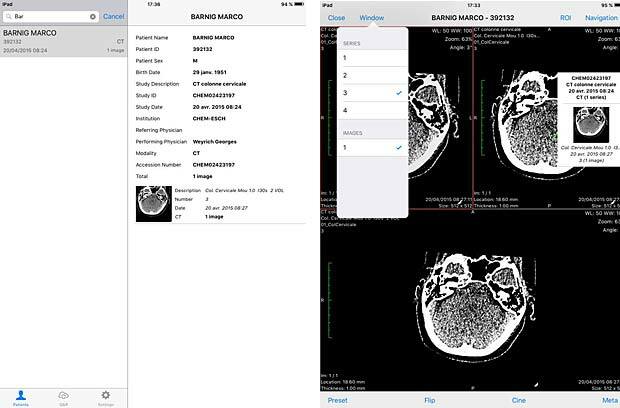 R-Site Mobile for IOS supports 2D, 3D and MIP/MPR operations for DICOM files. To use this app, you have to own at least one set of R-Site PACS. R-Site is developed by DJ HealthUnion Systems Corporation in China. The current version 1.0.2.47 was updated on August 31, 2016. ResolutionMD enables doctors to securely view patient images and reports from a wide variety of computers and mobile devices, collaborate with other practitioners and diagnose from any location. The product requires access to a configured ResolutionMD Server. It contains a demo mode to allow to experience the full functionality of ResolutionMD on a variety of anonymous patient images. ResolutionMD is devloped by Calgary Scientific Inc. The free version 5.3.3. was updated on July 19, 2016. 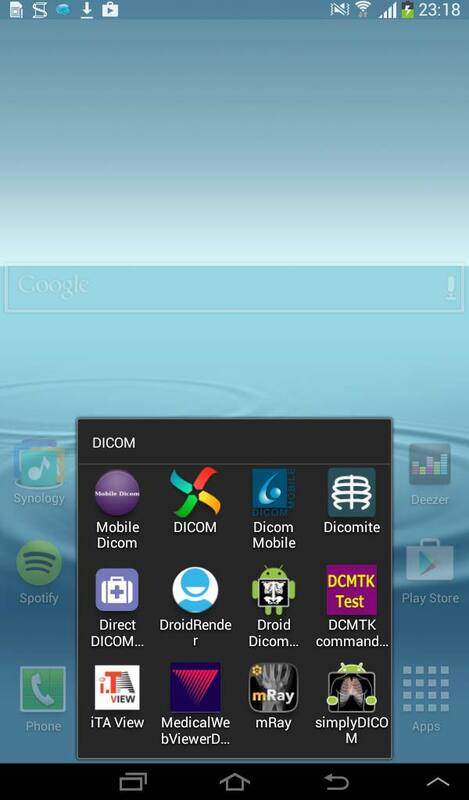 The current Android version 1.3.2 of DICOM Mobile was updated on August 13, 2014. The price is the same as for the iOS version : 2.99$. 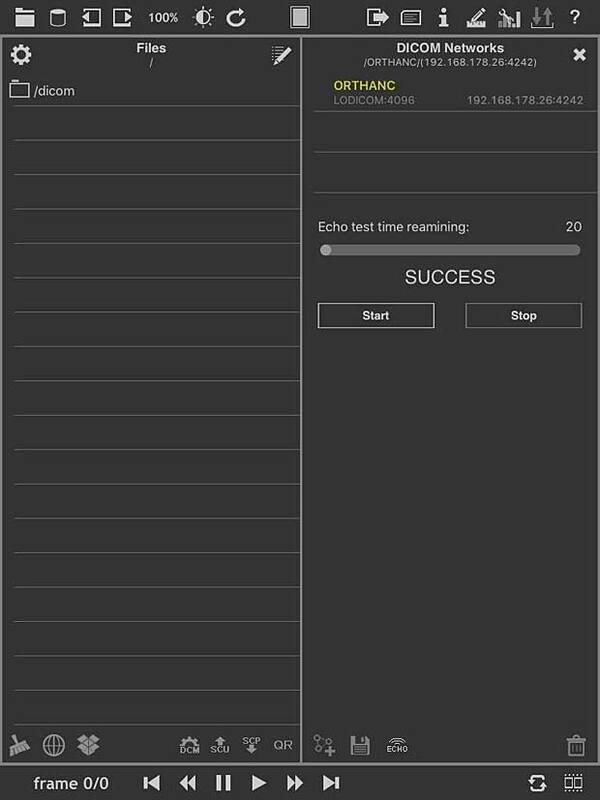 The GUI and the features of the viewer are also identical to the iOS version. DICOM images can only be loaded from DropBox or from other web servers. The Android free version 2.0.1 of iPaxera was updated on September 15, 2016. This app requires Android 4.4 or greater and I was not able to test it on my Samsung Galaxy tablet running Android 4.2.2. A few days later I changed my Blackberry phone with an LG Spirit phone running Android 5.0.1. 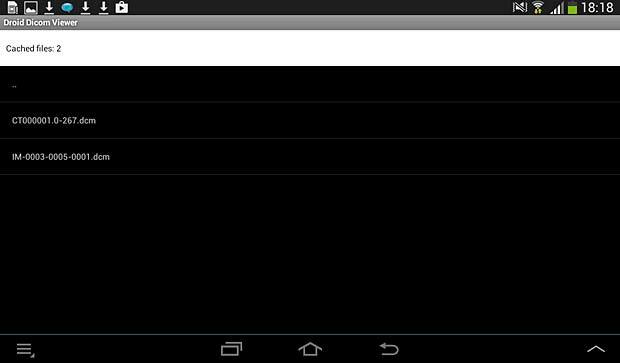 After installing iPaxera on this phone, I noticed that the Android version is different from the iOS version and allows no PACS server configuration, but only dowloads of DICOM files from Dropbox or iTune sharing. The Android free, but limited, version 1.10 of iTA View was updated on October 27, 2014. An in-app upgrade priced 26.99 EUR is available through the Google Play Store. 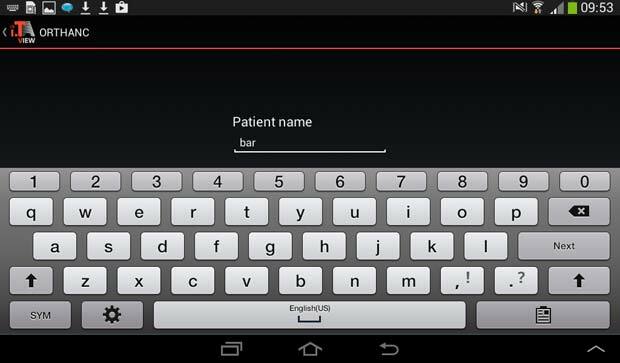 The Android version of the LEADTOOLS MedicalWebViewer is the online live demo of the Medical Web Viewer Framework included with LEADTOOLS PACS Imaging and Medical Imaging Suite. The current version 1.4.1 was updated on February 2, 2014. The Android free version 4.1.6 of mRay was updated on September 23, 2016. 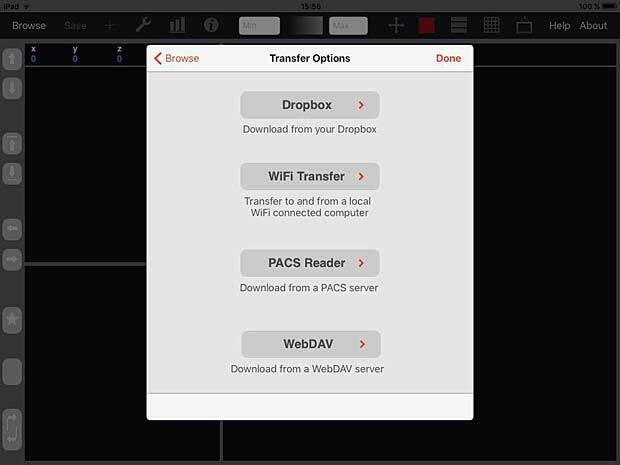 The mRay app can not be used without the installation of the mRay Server Software. Dicomite is a free and powerful DICOM viewer with intuitive and simple user interface, optimized for use on multi-touch devices. Dicomite is developed by Samsung MNO Lab. The current version 1.7.1 was updated on October 11, 2016. To display images they must be downloaded into the local memory with an Internet browser. The Direct DICOM Viewer is developed by Hui Zhang. The current version 1.2.4 was updated on March 21, 2015. To display images they must be downloaded into the local memory with an Internet browser. 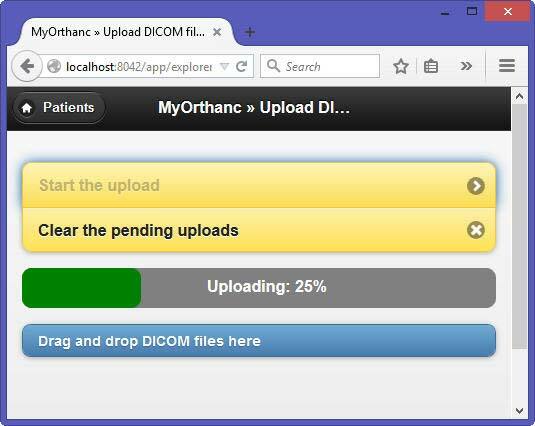 The app works however as DICOM server and local DICOM files can be stored to the Orthanc server. 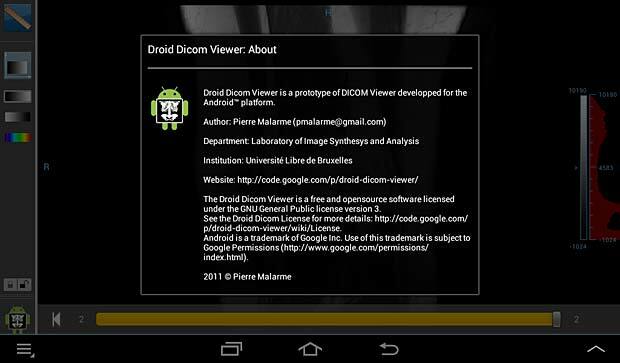 The Droid Dicom Viewer was developed by Pierre Malarme. The free current version 3.2.3 was updated on May 17, 2011. 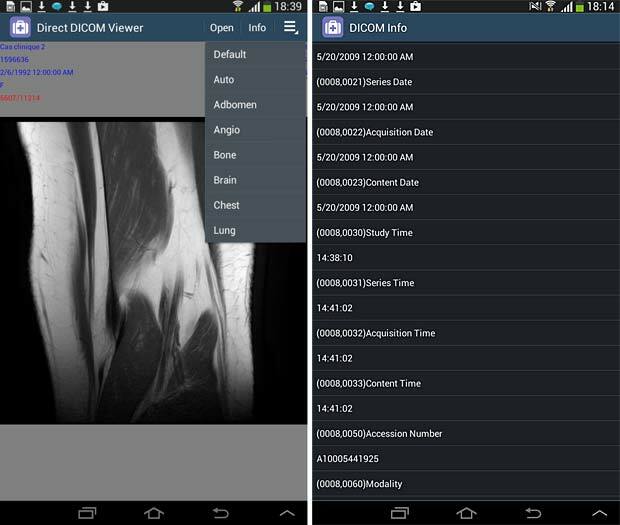 Droid Dicom Viewer is a Free and Open Source Software (FOSS) licensed under the terms of the GNU General Public License. To display images they must be downloaded into the local memory (cache) with an Internet browser. volume rendering and tissue segmentation and display. Developed by Startm, the current version 3.2.0 was updated on August 26, 2016. The app proposes in-app purchases at prices between €1.04 – €104.08 per item and displays ads at the bottom of the screen. To display images they must be downloaded into the local memory (cache) with an Internet browser. 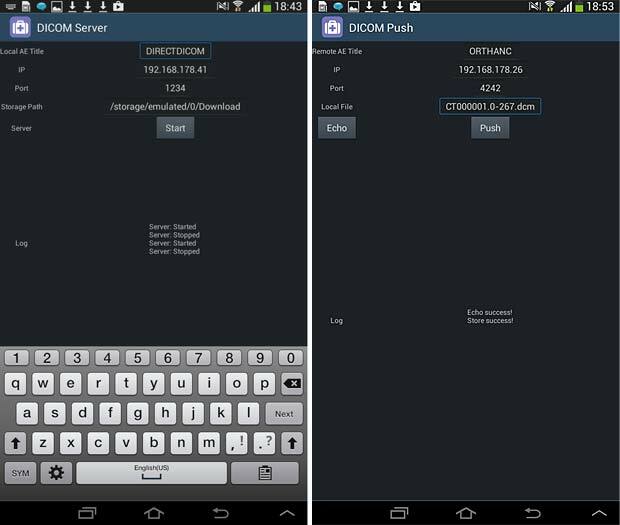 Mobile Dicom is a free Android Mobile Dicom (Diconde) Viewer application which is based on opensource OFFIS DCMTK as its backend library. 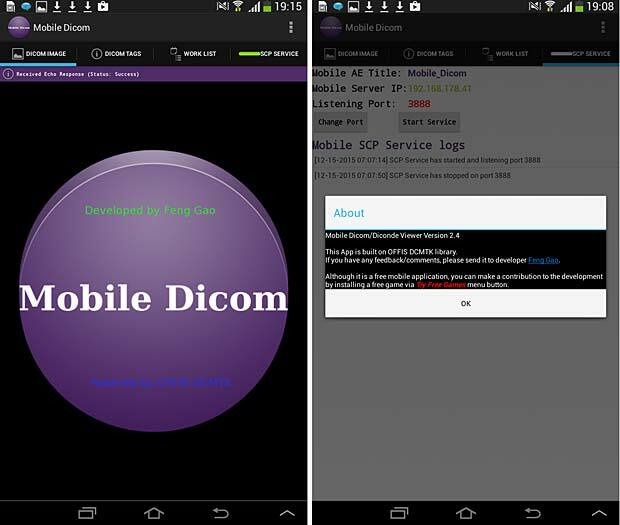 Inspired by opensource community and in the hope of extending usage of the library on Android devices, the Mobile Dicom / Diconde tool was created by Feng Gao. The current version 2.4 was updated on November 23, 2015. To display images they must be downloaded into the local memory (cache) with an Internet browser. The app works however as DICOM server and can store local DICOM files tthe Orthanc server. Simply DICOM is currently in public beta. It should work with any uncompressed DICOM images, downloaded into the local memory. The viewer has a minimal interface to keep the focus on the images themselves. The developer is Christopher Boyd. The current version 0.7.3 was updated on May 27, 2015. To display images they must be downloaded into the local memory (cache) with an Internet browser. 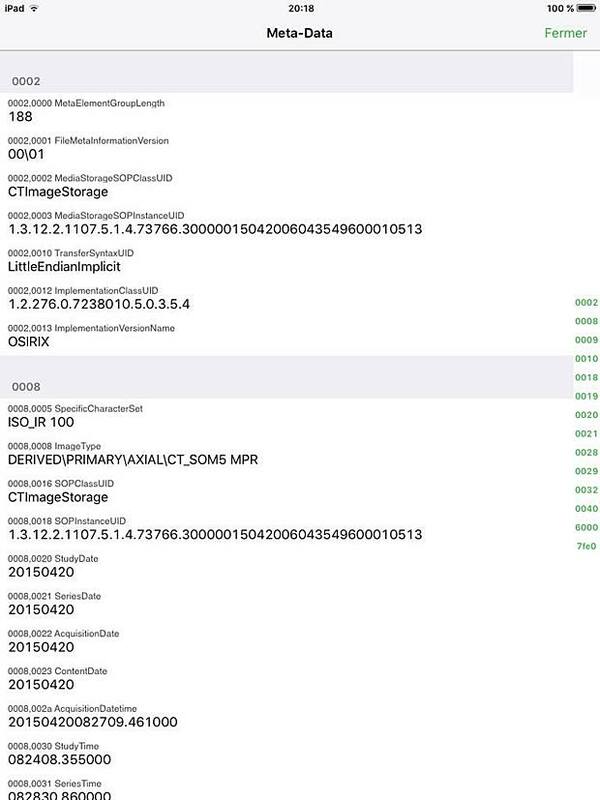 If DICOM files are served with the extension .dcm or/and with the content type application/dicom, they are recognized as DICOM images in iOS Safari and can be opened directly in the following DICOM viewers : MedFilm, MyXray, Osirix HD, DICOM IR, iMango or Dicom Mobile. 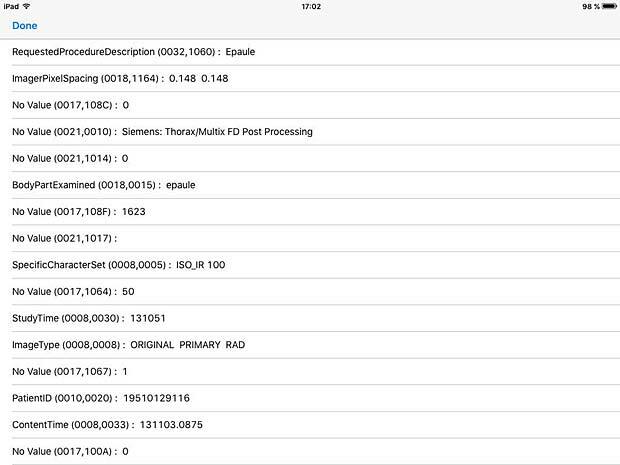 DICOM files embedded in .zip archives are recognized by the same DICOM viewers in the iOS Safari browser. 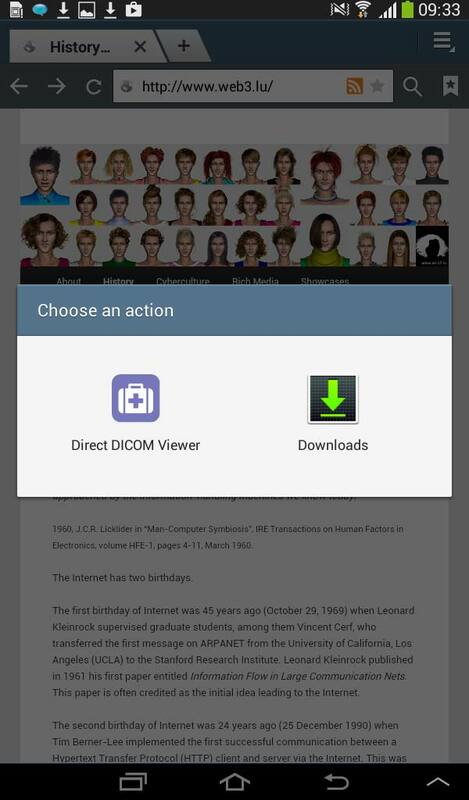 On Android devices, DICOM files are only recognized by the DIRECT DICOM viewer in the Android browser, but they can be downloaded in the /storage/emulated/0/Download/ folder where they are accessible by most Android DICOM viewers. Among the 29 tested native mobile DICOM viewers, 18 are iOS apps, 6 are Android apps and 5 are available on the two platforms. 9 viewers can be configured to access a vendor-neutral PACS server, but only 5 of them work as expected and comply with the Orthanc PACS server. Among them are the three renowned commercial viewers iMango, iTA View and Osirix (priced between 15 and 50 USD), one free app (iPaxera) developed by a world leading medical imaging solution provider (Paxeramed Corp) and one app (DICOM IR) created by an independent free-lance developer ( Pietro Zuco). 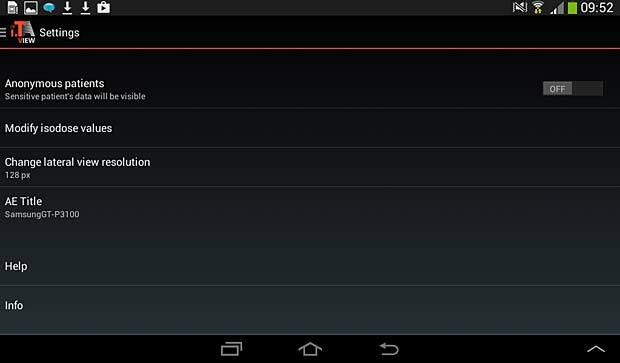 The other 4 configurable viewers are limited, partially disabled or crashing. The remaining viewers are demo apps working with proprietary PACS systems, displaying only DICOM files loaded from DropBox or from another web server or crashing and working not at all. 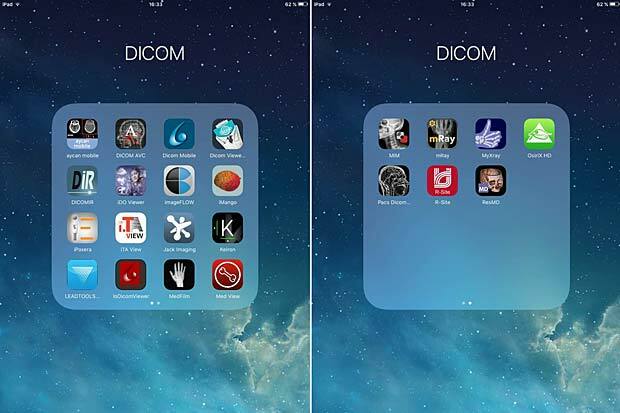 There are additional DICOM viewer apps in the AppStore and the Google PlayStore which are not listed because they were not updated in the last two years. I was shocked to see that most native mobile apps in the medical domain are not state of art. Apps in the stores which have not been updated in the last few years, text errors in the menus, program errors in the logic ( 2 viewers change the AETitle during communications), crippled GUI’s when the orientation of the device changes, wrong version numbers in the about panel etc, are testimonies of the poor quality. 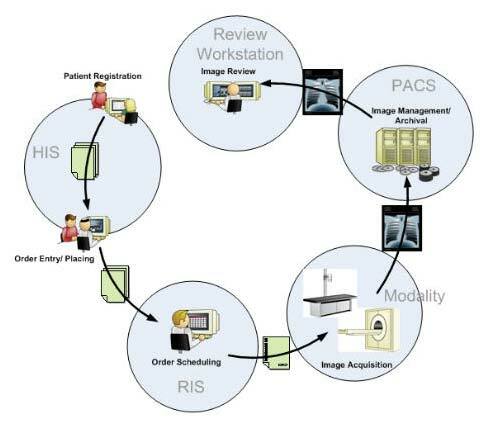 Today one project is generally considered as a reference for DICOM applications : OsiriX. The OsiriX project started in November 2003. The first version was developed by Antoine Rosset, a radiologist from Geneva, Switzerland, working now at the La Tour Hospital in Geneva. He received a grant from the Swiss National Fund to spend one year in UCLA, Los Angeles, with Prof. Osman Ratib, to explore and learn about medical digital imaging. 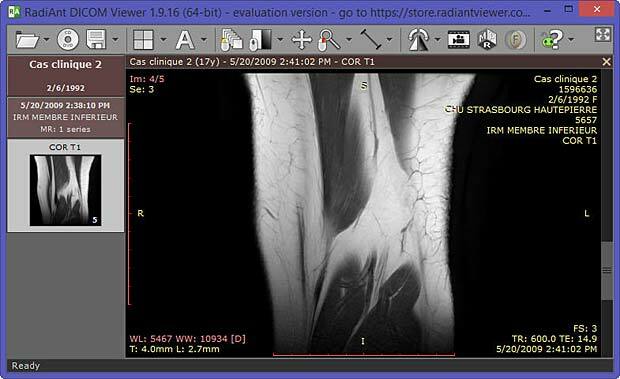 In October 2004, Antoine Rosset went back to the Geneva University Hospital in Switzerland, to continue his career as a radiologist, where he published an OsiriX reference article in June 2004 in the Journal of Digital Imaging. Joris Heuberger, a mathematician from Geneva, joined the project in March 2005 on a voluntary fellowship of 6 months in UCLA, Los Angeles. In June 2005, OsiriX received two prestigious Apple Design Awards : Best Use of Open Source and Best Mac OS X Scientific Computing Solution. Osman Ratib, Professor of Radiology in UCLA, returned to Geneva at the end of 2005 as the chairman of the Nuclear Medicine service. In March 2009, Antoine Rosset, Joris Heuberger and Osman Ratib created the OsiriX Foundation to promote open-source in medicine. In February 2010, Antoine Rosset and Joris Heuberger created the company Pixmeo to promote and distribute the OsiriX MD version, certified for medical imaging. This version complies with the European Directive 93/42/EEC concerning medical devices. The price for a single licence is 678 EUR. The free lite version can be downloaded from the OsiriX website, the source code is available at Github. OsiriX runs on Mac OSX and is released under the version 3 of the GNU Lesser General Public License. The current version is 7.0 and was released on December 7, 2015. Osirix can also be configured as a PACS server. The power of OsiriX can be extended with plugins. 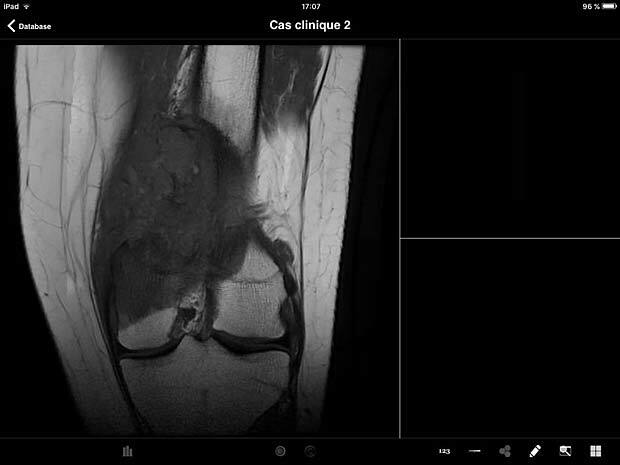 An Osirix HD version for the iPad is available at the AppStore for 49,99 EUR. 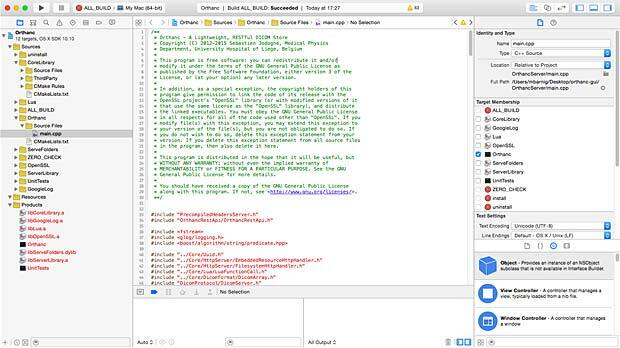 DICOM toolkits are more than simple viewers; they are a complete set of tools, code samples, examples, documentation, tutorials etc to develop great healthcare applications. DCMTK is a collection of libraries and applications implementing large parts the DICOM standard. It includes software for examining, constructing and converting DICOM image files, handling offline media, sending and receiving images over a network connection, as well as demonstrative image storage and worklist servers. DCMTK is is written in a mixture of ANSI C and C++. It comes in complete source code and is made available as open source software. 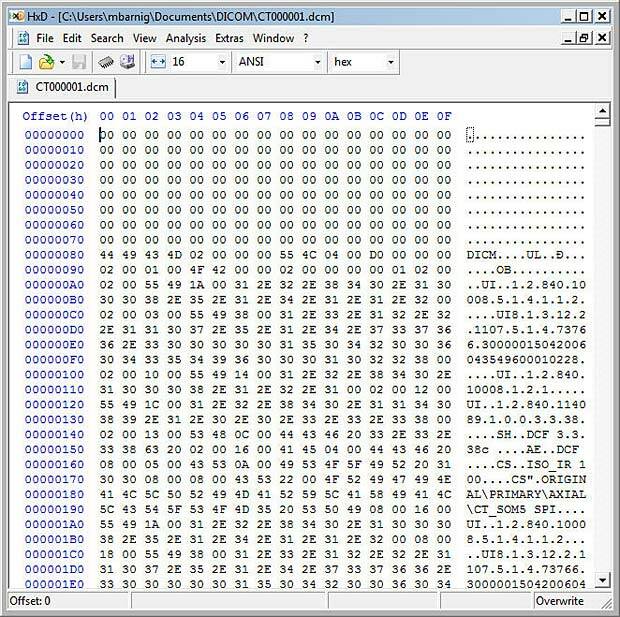 DCMTK is an ancestor of DICOM applications. In 1993, before the official release of the standard, a DICOM prototype implementation was created by OFFIS, the University of Oldenburg and the CERIUM (Centre Européen d’Imagerie à Usage Médical) research centre in Rennes (France) on behalf of the European Committee for Standardization (CEN/TC251/WG4). The current version of DCMTK is 3.6.1, released in June 2015. The related snapshot is available at the dicom.offis.de website. 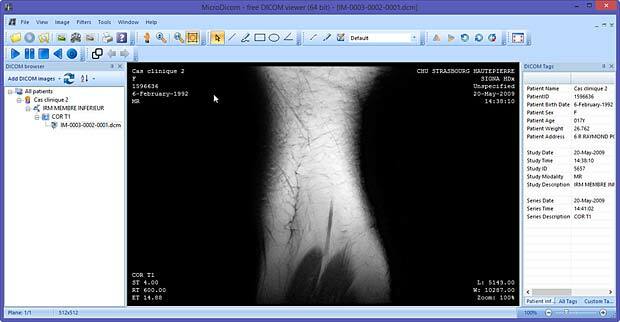 DICOMscope is the related free DICOM viewer which can display uncompressed, monochrome DICOM images from all modalities and which supports monitor calibration according to DICOM part 14 as well as presentation states. DICOMScope 3.6.0 for Windows, implemented in a mixture of Java and C++, was released in 2003. DICOMscope can’t be installed on newer Windows systems (Vista, Windows 7, Windows 8.1), an error 105 (setup.lid missing) is issued. Some DCMTK modules, especially those that are not part of the free toolkit, are covered by a separate license which can be found in the COPYRIGHT file in the corresponding module directory. These tools can be evaluated during a period of four months, any further use of the software requires a full licence agreement, free of charge. dcm4che2 is a collection of open source applications and utilities for the healthcare enterprise developed in the Java programming language. dcm4chee2 is a DICOM Clinical Data Manager system. The dcm4che history states that back around the year 2000, Gunter Zeilinger wrote the popular JDicom utility suite using commercial Java DICOM Toolkit (JDT). After this experience, he decided to develop his own toolkit and to name it after Che Guevara. dcm4che and dcm4chee are licensed under an MPL/GPL/LGPL triple license, similar to Mozilla. 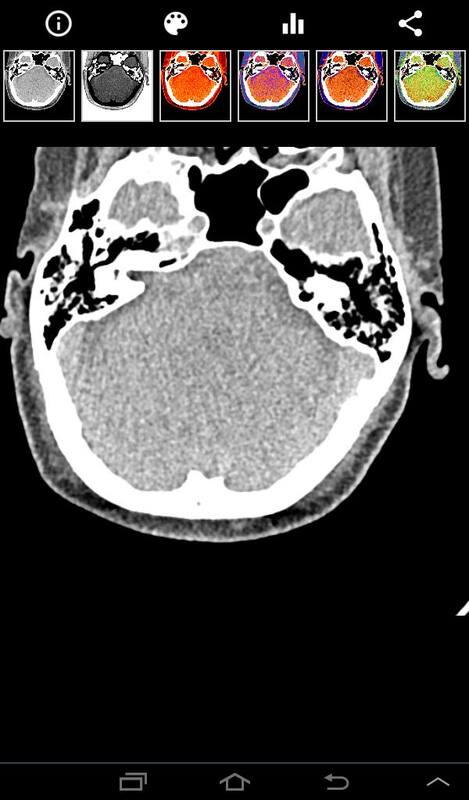 The dcm4che DICOM viewer is called Weasis. The current version is 2.0.4, released on June 23, 2015. Grassroots DiCoM is a C++ library for DICOM medical files. It is accessible from Python, C#, Java and PHP. It supports RAW, JPEG, JPEG 2000, JPEG-LS, RLE and deflated transfer syntax. It comes with a super fast scanner implementation to quickly scan hundreds of DICOM files. It supports SCU network operations (C-ECHO, C-FIND, C-STORE, C-MOVE). The current version is gdcm-2.6.3, released on January 27, 2016. The GDCM source code is available at Github. A Wiki is available at Sourceforge, a reference to GDCM is available at Wikipedia. The project is developed by Mathieu Malaterre (malat) from Lyon, France. 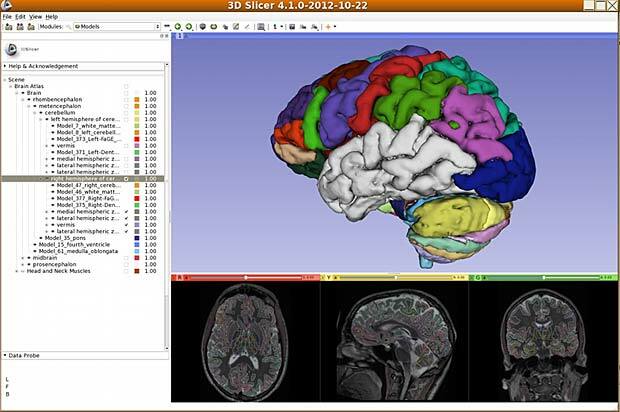 3D Slicer is a free and open source software package for image analysis and scientific visualization. It’s more than a simple DICOM viewer. This outstanding project started as a masters thesis project between the Surgical Planning Laboratory at the Brigham and Women’s Hospital and the MIT Artificial Intelligence Laboratory in 1998. 3D Slicer is written in C++, Python, Java and Qt and can be compiled for use on multiple computing platforms, including Windows, Linux, and Mac OS X. 3D Slicer needs a powerful computer to run. The current version is 4.5.0-1, released on November 11, 2015. It’s distributed under a BSD style, free, open source license. More than 50 plug-ins and packages of plug-ins are available. The main developers are now Steve Pieper, Slicer’s principal architect and Ron Kikinis, Principal Investigator for many Slicer-related projects. The names of all contributors are available at the 3D slicer.org website. 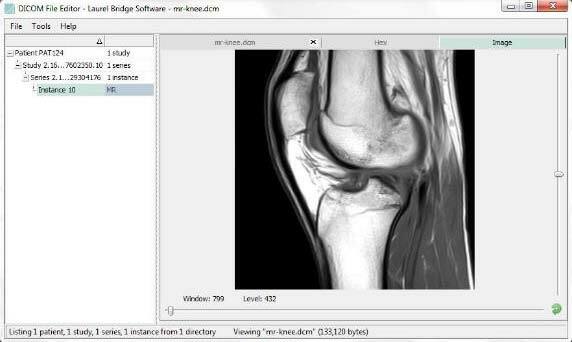 3DimViewer is a lightweight 3D viewer of medical DICOM datasets distributed as open source software. The viewer is multiplatform software written in C++ that runs on Windows, Linux and Mac OSX systems. 3DimViewer is developed by 3Dim Laboratory s.r.o., a company specializing in applications of modern computer graphics in medicine and developing innovative solutions. Founded since 2008, the company focuses on medical image processing, 3D graphics, geometry processing and volumetric data visualization. The company office is located in Brno, Czech Republic, next to many high tech companies inheriting the spirit of South Moravian Innovation Centre. The current version of 3DimViewer is 2.2, released on February 6, 2015. Several plugins are available to extend the functions. Binaries are available for download on the 3DimLab website, source code is available at BitBucket. 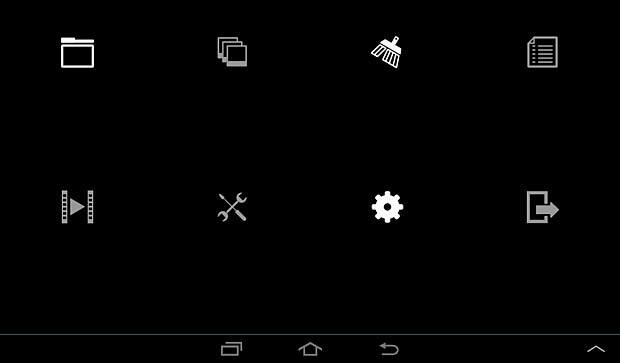 GDCMviewer is the simple tool that show how to use vtkGDCMImageReader. It is basically only just a wrapper around GDCM. The tool is meant for testing integration of GDCM in VTK. 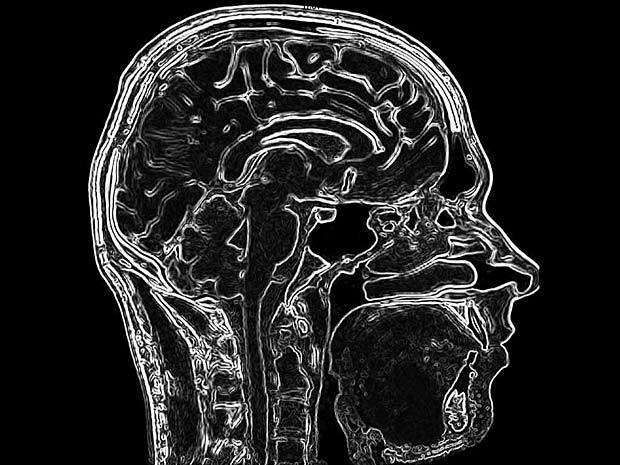 Most free proprietary DICOM viewers are copyrighted by their owner and are available for use, as is, free of charge, for educational and scientific, non-commercial purposes. Some of them are included on DICOM CDs provided by the hospitals to the patients. Mango (short for Multi-image Analysis GUI) is a viewer for medical research images, developed by Jack L. Lancaster, Ph.D. and Michael J. Martinez at the University of Texas. The software and data derived from Mango software may be used only for research and may not be used for clinical purposes. If Mango software or data derived from Mango software is used in scientific publications, the Research Imaging Institute UTHSCSA must be cited as a reference. The Orpalis DICOM Viewer is a free tool for medical staff to view DICOM files. The current version 1.0.1, released on June 20, 2014, should run on any 32- or 64-bit Windows System, but I experienced serious problems on my Windows 8.1 system (thumbnails are not displayed, frequent viewer crashes, …). 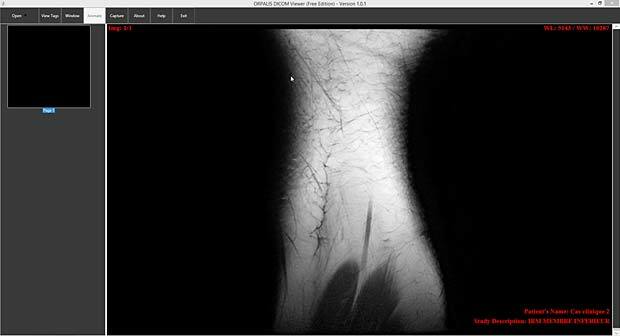 The ORPALIS DICOM Viewer is based on the GdPicture.NET SDK. 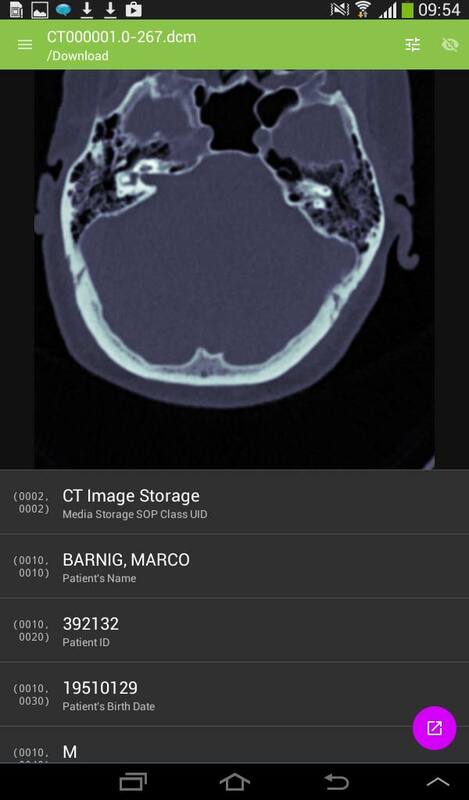 MicroDicom is an application for primary processing and preservation of medical images in DICOM format, with an intuitive user interface and being free for use and accessible to everyone. MicroDicom runs on Windows, the current version is 0.9.1, released on June 2, 2015. The EMV viewer is developed by Escape, which was founded in 1991 and is based in downtown Thessaloniki, Greece. EMV 4 for Windows was released on October 10, 2014, EMV 4.4.1 for Mac OSX was released on July 21, 2015. You can download and evaluate the software for free, but you need a license for using it in a commercial environment. The price for one license is 245 EUR, for use on up to three computers. Since version 10 (CS3) launched in April 2007, Photoshop provides a comprehensive image measurement and analysis tools with DICOM file support. 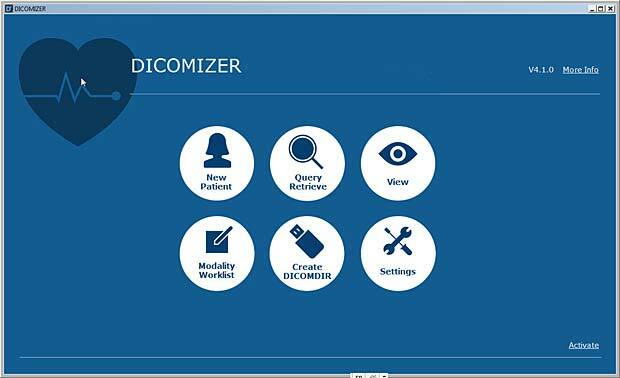 Dicomizer is a Point-Of-Care Imaging and Reporting tool provided by H.R.Z Software Services LTD in Tel-Aviv, Israel. The company is specialized in developing Medical Device, Healthcare IT, DICOM and HL7 solutions and provides medical imaging consultation, development services and professional courses. The company was founded in 2002 (formerly RZ Software Services) by Roni Zaharia, a medical imaging and connectivity expert, who is acting as its CEO. Roni Zaharia is the author of the blog DICOM is easy, providing useful news about medical images and an outstanding DICOM tutorial. Dicomizer works on Windows, the current version is 5.0. The price of a licence is $470 USD, a free evaluation version is available. The annual update costs are $120 USD. 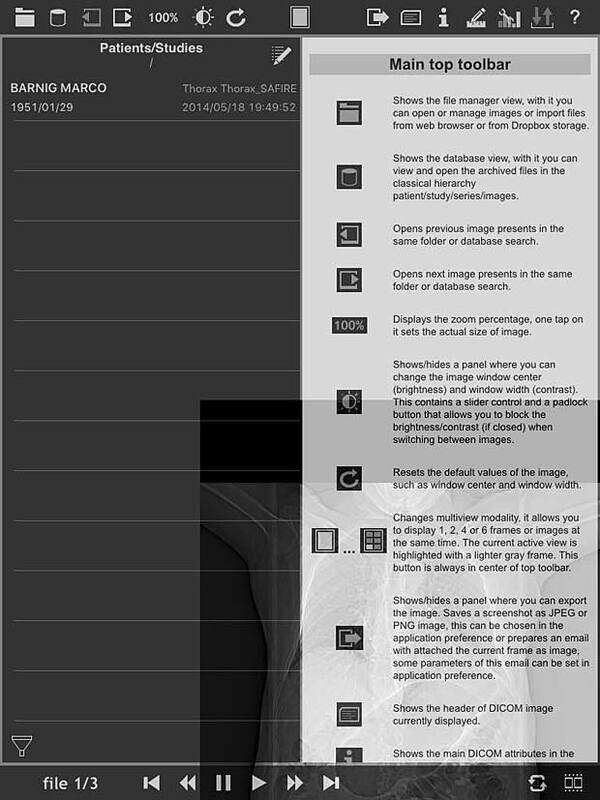 Dicomizer can also be used as an DICOM image generator. 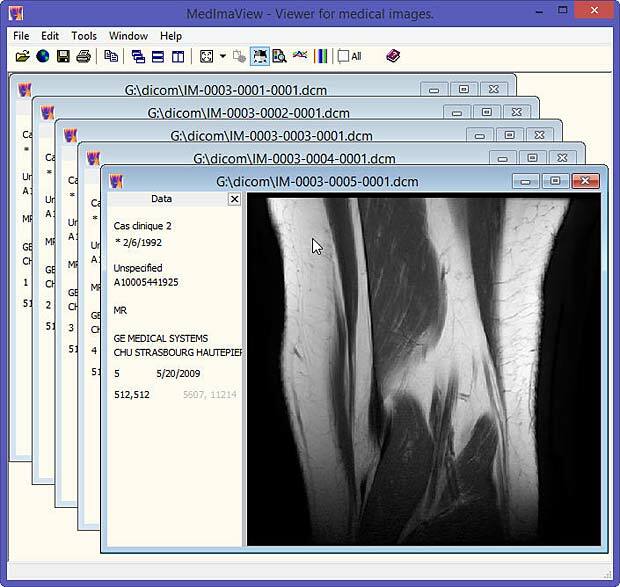 MedImaView is a multi-modality DICOM viewer with an intuitive Windows Graphical User Interface. It’s part of PowerDicom Technologies, an All-in-One application for handling DICOM files developed by DICOM Solutions, an MHGS company. Licenses for PowerDicom (version 4.8.6 released on May 4, 2015) are available in a price-range from 39 EUR to 310 EUR. PowerDicom allows also the generation of DICOM images. 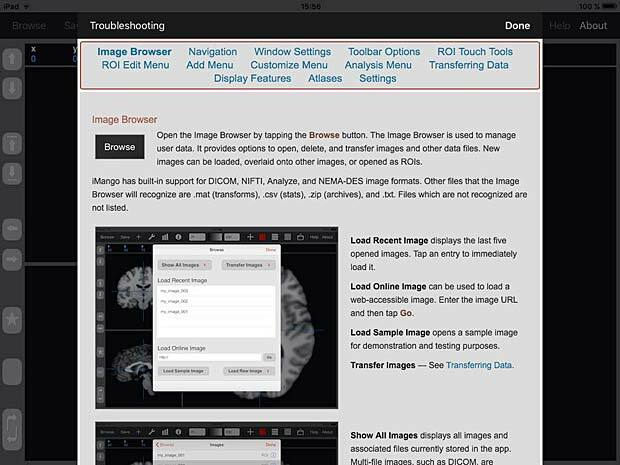 A free trial version can be downloaded from the DICOM Solutions website. MedImaView (version 1.8) is free for personal use and students. DICOM PowerTools are developed by Laurel Bridge who provides imaging workflow solutions and DICOM software products to the medical imaging industry. PowerTools are a suite designed for the testing, troubleshooting, or debugging of applications that use DICOM communications. 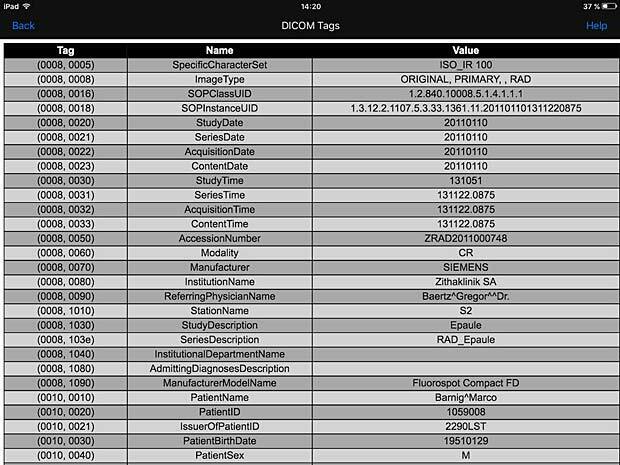 PowerTools also provides for the viewing, repair, or creation of DICOM data sets and their contents. The current version is 1.0.34, released on November 24, 2015. 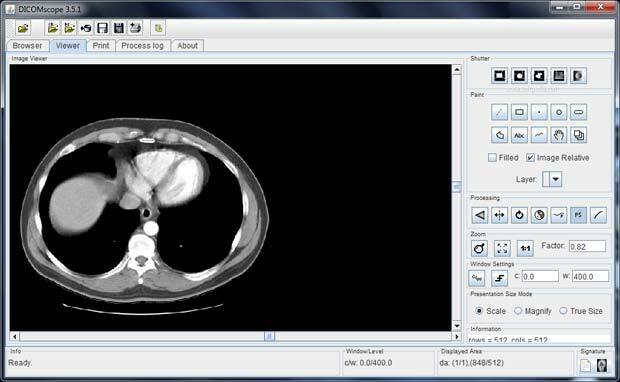 RadiAnt is a DICOM viewer for medical images designed with an intuitive interface and unrivaled performance. It runs on Windows, the latest version is 2.2.8.10726, released on December 11, 2015. The prices for a license range from 72 EUR to 400 EUR. A free evaluation version is available. RadiAnt is not certified as a medical product and is not intended for diagnostic purposes. RadiAnt is developed by Medixant, a small, privately funded company that was first formed by Maciej Frankiewicz in 2011 in Poznan, Poland. Headquartered in Cleveland, Ohio, Codonics develops, designs, sells and supports leading-edge medical imaging and information management devices used in diagnostic imaging. Codonics Clarity Viewer features simple image navigation and selection, an intuitive user interface, quick viewer launch and rapid image loading. 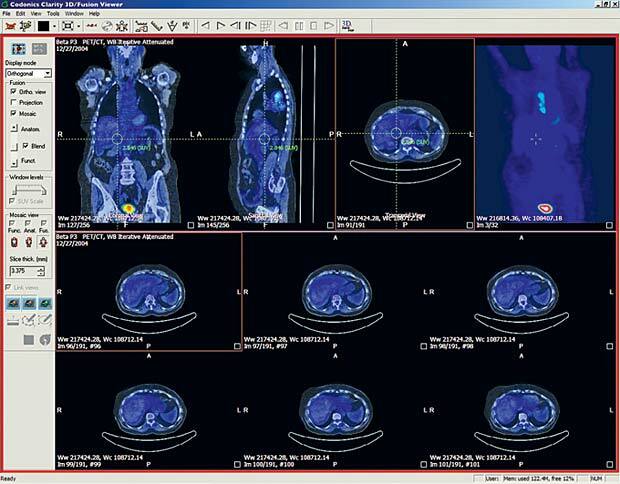 The Codonics Clarity 3D/Fusion Viewer is extremely useful for viewing diagnostic imaging results. It is a comprehensive PET/CT viewer that is simple to use for single or comparison study review. 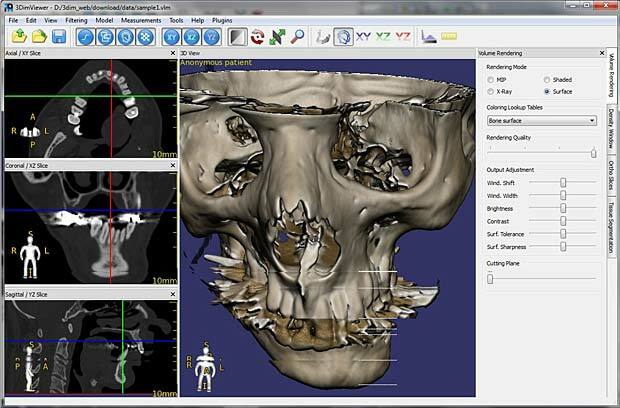 All basic features of the Codonics Clarity Viewer are also included. The Image Processing Toolbox of MatLab includes import, export and conversion functions for scientific file formats, amomg them DICOM files. The available functions are dicomanon, dicomdict, dicomdisp, dicominfo, dicomlookup, dicomread, dicomuid, dicomwrite. 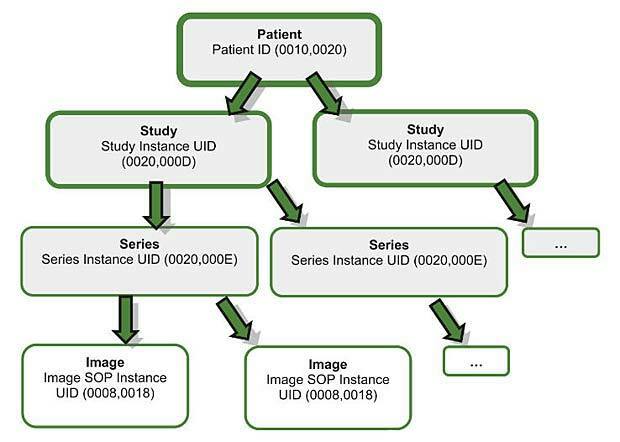 A tutorial shows how to write data to a DICOM file. 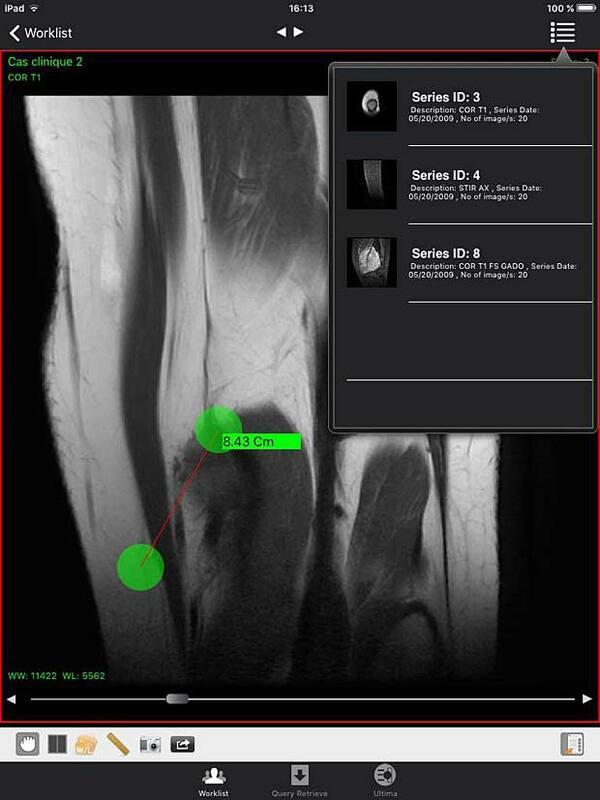 The mobile DICOM viewers are presented in a separate contribution. Referring to my recent post about the DICOM standard, the list of all valid transfer syntaxes is shown below. A DICOM transfer syntax defines how DICOM objects are serialized to transmit them through a network or to save them into a file. The DICOM transfer syntax is specified by the TransferSyntaxUID located in element number (0002, 0010). There exist 35 different DICOM transfer syntaxes, but 14 have been retired from earlier standard versions and will not be supported in future DICOM releases.